If you have not yet bought yourself an adult coloring book, do it now. Stop waiting. They are wonderful. I've actually had many kids' coloring books over the years to use myself, but recently bought this one for my dad as a whimsical Father's Day gift. I immediately became green with envy on seeing the pages inside and now need every variety for myself. Like yesterday. These books have been bestsellers for quite some time now so I'm sure you've heard about them or already have one, or two, or ten, but I needed to throw in my two cents and spread the word. 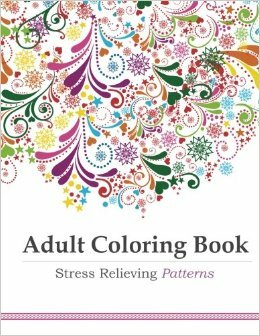 Out of all of the books available, I personally prefer--and would recommend starting with--this one: Adult Coloring Book: Stress Relieving Patterns. The pages inside range from very small detailed designs to larger, more beginner-friendly ones--these are the pages I like the best. I think the patterns are the most mindless and thus the most enjoyable to complete. When the designs reflect well known images (suns, flowers, etc. ), I still feel the weight of "I'm an adult and I should follow the rules." I feel like the sun can only be oranges, reds, and yellows, and that the flowers should reflect the colors I see in nature. I draw inside the lines. Some people are more rebellious than this--good for you! I'm still starting out, so the patterns are the happening place to be. There are, however, so many other varieties to enjoy. There's a second volume of patterns, as well as paisley patterns (I think I'll try this one next), stained glass patterns (gimme, gimme, gimme), creative patterns, Mandala patterns, animal designs, cats, peacocks (cool! ), Biblical scripture verse art (I should recommend this to my friend Emily--she loves quote art), one for Dia de los Muertos (for Ebeth), another with art deco style pages, plus ones for Mother's Day, ones with art therapy designs, and many others. The books are best suited for using colored pencils for drawing inside--crayons would be too large and markers would either be too thick or, let's face it, too fast and easy. The joy of coloring these pages is the calming pace--it's not a race to the finish line because there is no grading and no competition. How wonderful. 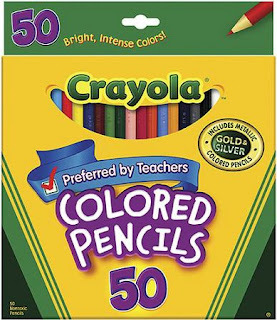 I'd recommend Crayola's 50-pack (I only got the 24-pack and need to upgrade). Has anyone else been enjoying these books? Which is your favorite? Any images of your finished pages you would like to share? That's funny! I haven't seen that commercial--sounds really cheesy--but the books are great.